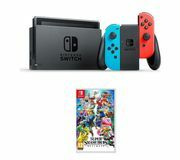 Here at Latest Deals, you will find the Smash Bros video game bundles that you are looking for easily and at very reasonable rates. Don’t forget to use the latest Smash Bros voucher codes to save money on your purchases. Stick to your budget when you use voucher codes from your favourite retailers to maximise your savings. Our team of awesome bargain hunters has selected the best and latest special Smash Bros offers and deals from Currys PC World, Argos, and other trusted retailers. Try out all the games and you will surely be entertained. Best Smash Bros discount codes available online! Super Smash Bros. is created and published by Nintendo. It is a series of crossover fighting video games. It features characters from different Nintendo games and their franchises. The game series was created by Masahiro Sakurai. The gameplay objective of the game is different from the traditional fighting games. The main goal in the game is to know opponents off the stage rather than depleting the life bars of the characters. Super Smash Bros. was released for Nintendo 64 in 1999. The game was originally released in Japan but with its domestic success, the developers decided to release the game worldwide. The series achieved success with the release of the Super Smash Bros. Melee which was developed and released for GameCube in 2001. It became the best selling game for that particular gaming console. The game series features many famous characters including Pikachu, Yoshi, Kirby, Fox McCloud, Samus Aran, Link, Donkey Kong, and Mario. It is a very interesting game with its original game having only 12 playable characters. The roster of playable characters keeps increasing for each successive game. Furthermore, the game also included many additions including multiplayer features. There is also an increase in a competitive community that features gaming tournaments. Super Smash Bros. is a very entertaining game and there are lots of playable characters that are added with every succeeding game. This makes it less boring since you get to play with these new characters. You can even customise your own stages in some of the game versions. Playing Super Smash Bros. games is also a great way to kill time. It can be played by children and adults and it can be a great bonding time for them. Playing these games also allows you to improve your gaming skills. You are able to play characters from other video games since this is a crossover fighting video game series. Super Smash Bros. This game was introduced for Nintendo 64 in 1999. It featured eight playable characters including Donkey Kong, Link, Mario, Pikachu, Kirby, Yoshi, Fox, and Samus. It also features unlockable characters including Jigglypuff, Ness, Captain Falcon, and Luigi. Super Smash Bros. Melee. This game was released in 2001. This introduced two new single-player modes together with the classic mode. It has segments that are similar to the "Race to the Finish" mini-game. The All-star mode is a fight against every character in the game with only one life. Super Smash Bros. Brawl. This game was introduced in 2008. It featured third-party characters including those from Metal Gear series. This game also allowed players to construct their own stages. It has a total of 41 stages and 39 playable characters. Super Smash Bros. for Nintendo 3DS and Wii U. This was released in 2014 with additional characters including Mega Man and Villager. The game is a co-production of Bandai Namco Entertainment and Sakurai's Sora Ltd.
Super Smash Bros. Ultimate. This game was released in 2018 by Bandai Namco Entertainment. It is a game that was intended for Nintendo Switch. It featured additional characters including Simon Belmont, Echo Fighters Princess Daisy, Ridley, King K. Isabelle, Rool, and the Inklings from Splatoon. 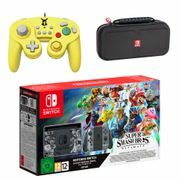 You might be interested in playing Super Smash Bros. Good thing our team has listed the most affordable and latest Smash Bros deals from the most trusted and reliable brands and online retailers. We have gathered and tested the latest Smash Bros Ultimate deals so you can be assured that any voucher code is up-to-date. 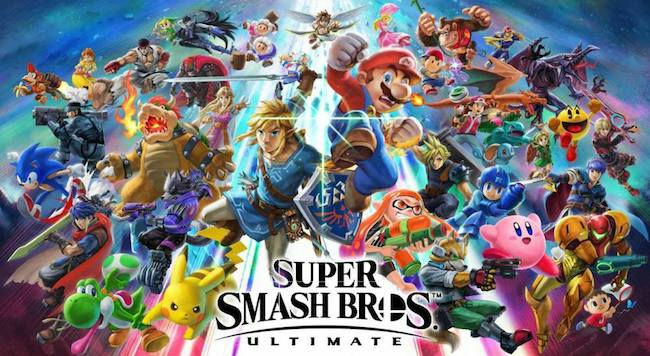 With our assistance, you can fulfill and purchase the Smash Ultimate games on your wishlist at very affordable prices. Do check out the Latest Deals site frequently to get information about cheap Super Smash Bros Wii U offers, deals, and voucher codes. You can save a lot of money when you purchase game bundles. You can also complete the Smash Bros game series and get big discounts. 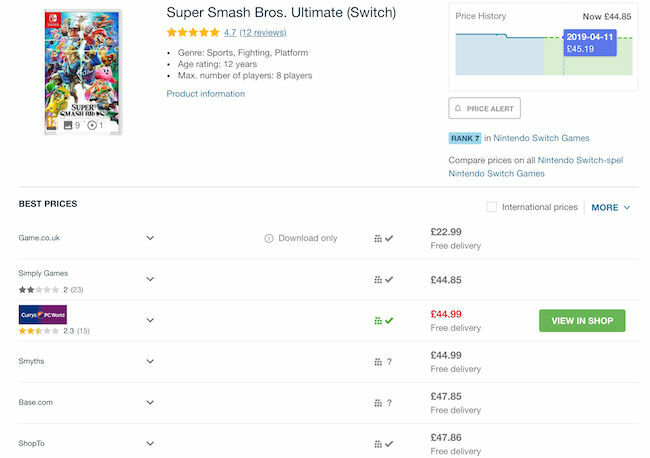 You can actually save as much as 60% on selected Smash Bros games. Another tip for you to get great value for your money is that you should be aware of the return policy of the retailers so that you can have your orders replaced if you receive defective or damaged ones. If you are looking for Super Smash Bros 3DS, Super Smash Bros 5, or Super Smash Bros Melee for sale online then you came to the right place. Our supportive team of bargain hunters has listed the latest Super Smash Bros on PC deals and special offers available for you. Special offerings such as free deliveries, extended warranties, and discounted rates are also up for grabs. You can go over our list of the latest Super Smash Bros link Amiibo deals and offerings brought to you by our community of bargain hunters. We have updated the list of the latest limited edition Nintendo Switch deals just for you.